Celebrated annually on October 5th since 1994, this day serves to heighten awareness of the pivotal role that teachers play in modern society. It commemorates the signing of 1966 ILO/UNESCO Recommendation concerning the Status of Teachers, declaring education as a universal, fundamental right. The UNESCO theme for 2018 is “the right to education means the right to a qualified teacher,” which highlights the problematic global shortage of educators, coupled with an increase of children and youth lacking education. The Canadian Teachers’ Federation also outlines the importance of this day by recognizing teachers as the fundamental core of public education. Ontario is privileged to be gifted with one of the top education systems in the world: quality, accessible education that improves private and public prosperity, quietly and confidently forging leaders of tomorrow. 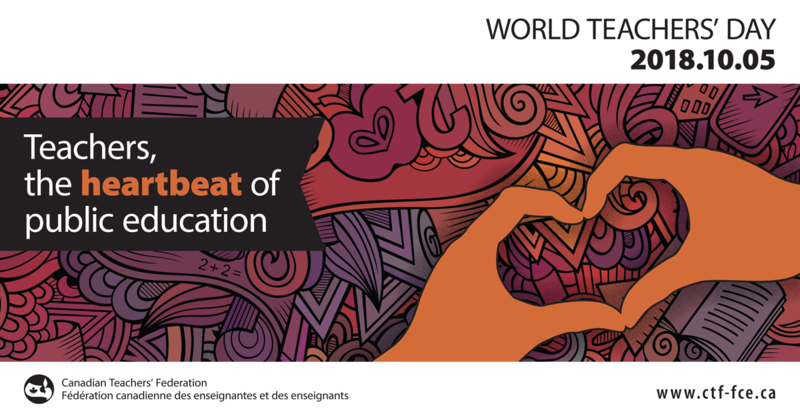 Today and every day, ETT celebrates teachers as the heartbeat of public education and upholds the critical role they play in the lives of students; children and youth who grow up to be members of an increasingly global and connected society. We commend the top-notch education teachers deliver and applaud their commitment to continuous learning and evaluation as highly-trained professionals. Between ubiquitous pressures to innovate and competing objectives in classrooms, our teachers’ reflexive pedagogical balance is laudable. With a toxic political climate creeping in, our teachers continue to meet and defeat challenges each day in the name of educating our children; we thank them and support their honourable role in Canadian society. May we continue to nurture our students to face our times with confidence and strength. Happy World Teachers’ Day to all our dedicated and caring ETT members.